Singing is a natural way to teach children about words. The rhythms in song help children decipher individual sounds and syllables and helps children to decode print. Children learn new and rare words by singing songs and nursery rhymes. 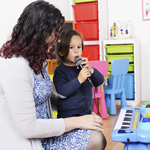 Singing to young children develops their language skills by focusing on intonation, rhythm, rhyme and speech patterns. Singing together is a fun, bonding experience. Children enjoy all kinds of music. Hum and sing every day. Sing your favorite Mother Goose and other nursery rhymes. Play soft music and move rhythmically with your baby. Sing a song very slowly, then very fast, and then in a silly voice. Sing a song about things you do every day. Sing nursery rhymes so children can hear the different sounds in words. Clap along to the rhythms in songs so children can hear the syllables in words. Teach your child a new song and ask her/him to hum along as you sing it. Then see if she/he can sing the words with you. Sing and dance with your child’s favorite music. Sing a book or poem. Check out these websites for great resources for literacy practice of singing. The following websites are great resources for the literacy practice of singing. Fingerplays are the perfect teaching tool for preschoolers! Discover song to sing with kids. This site includes the music and lyrics. A variety of songs, fingerplays, activity suggestions and song samples. Sing with Daniel about important social and emotional skills. A collection of fun preschool songs to ouse with your kids. These songs convey many of Mister Rogers' timeless messages. Colorado Public Libraries' librarians share singing skills. Songs from all over the world. Many have audio/video recordings. Story songs with animated illustrations to go along with them. Watch, listen and learn with educational Singer, songwriter Meridith Levande.